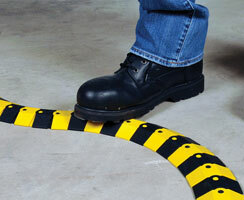 The Ultra-Sidewinder Cable Protection System helps protect workers from tripping over cords and cables. S-curves are easily made with this flexible design while maintaining a completely flat profile. No tools are needed to install the system, and the modular design makes it easy to reconfigure, repair and replace targeted segments – even while the cable remains connected.